NASA scientists have discovered a fourteenth moon circling Neptune, and this one's a wee lil' fella. Officially known as "S/2004 N 1," the moon is said to be a mere 12 miles across. As a result of its relatively tiny dimensions, this Neptunian moon is "roughly 100 million times fainter than the faintest star that can be seen with the naked eye" - so faint that it was utterly missed when Voyager 2 flew by Neptune in 1989. How could we possibly have missed an entire moon for so long? Obviously its miniscule size aids in this extraterrestrial game of hide and seek, but the more maddening explanation lies in the moon's speed. According to NASA, S/2004 N 1 completes a full lap of Neptune every 23 hours, making it extremely difficult to capture a useful image of the moon. "The moons and arcs orbit very quickly, so we had to devise a way to follow their motion in order to bring out the details of the system," says Mark Showalter of the SETI Institute, the man who discovered S/2004 N 1 on July 1. "It's the same reason a sports photographer tracks a running athlete - the athlete stays in focus, but the background blurs." The "athlete" in this case was originally identified as an odd white dot, but by tracking this dot across 150 archival images of Neptune, the researchers were able to compile enough data to discover a pattern. They were then able to plot an orbit for the dot, which nailed its identity as a very fast, very small moon. While we're all very happy for Neptune for picking up yet another moon - we've got one and Neptune has over a dozen, how is that fair? - but more impressive is the Hubble Telescope. Think about this: Neptune is roughly 2.7 billion miles away from earth (and that's at the point where the two planets' orbits cause them to be as close to one another as they can get). 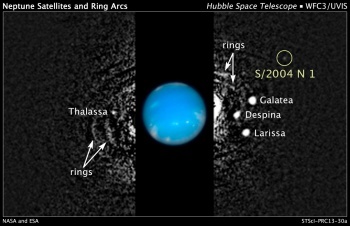 S/2004 N 1 is then another 64,000 miles away from Neptune. Despite these vast distances, the Hubble telescope (which orbits earth from roughly 350 miles above) was able to spot an object only 12 miles across. Neptune may have 13 more moons than Earth, but how many orbiting satellites representing the apex of man's efforts to explore the vast, inky blackness that surrounds us all like an existentially macabre blanket does it have? Exactly. The score remains Earth: 1, Neptune: 0.